Countless other editorials and expository pieces have already discussed Goldman Sachs’ second-quarter earnings report in length. What’s more interesting — and more in line with G2 Crowd’s recent #CoolestCompanies nomination — is that those market earnings were released just a few weeks after the bank announced the loosening of dress code regulations for its tech staff. An attractive company culture is a significant piece of social currency right now. “Cooler” tech companies like Google and LinkedIn are able to attract a bounty of talent because of such a culture. The so-called tech startup dress code of hoodies and jeans arguably plays a significant part. Here at G2 Crowd, tattoos abound and the norm is wearing tank tops, screenprinted T-shirts and shorts. Another perk? Considerate/accommodating professional relationships that are full of productive discourse, the kind that more regularly arise in a non-hierarchical organizational setting. An attractive company culture is a significant piece of social currency right now. ‘Cooler’ tech companies like Google and LinkedIn are able to attract a bounty of talent. According to Human Resources Director, 25 percent of Goldman Sachs’ 33,000 employees are engineers. In addition to engineers, Goldman Sachs’ tech staff includes software developers, cryptocurrency experts and, most recently, an expert iOS developer that would help the bank build a mobile application geared towards “its growing crop of digital retail banking services.” What would entice a smart engineer to abandon the dressed-down comforts of Silicon Valley for the conservatively buttoned-up Wall Street bank? 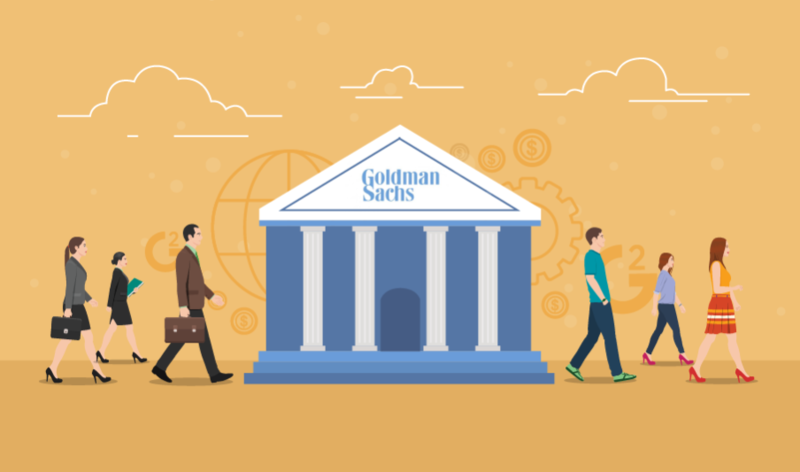 Goldman Sachs previously demonstrated its willingness to pivot away from tradition in order to fill out “weak spots” by luring two senior Credit Suisse bankers to join its investment bank in late June 2017. However, simply “dangling” coveted partner and vice president titles isn’t enough to attract and retain tech talent in today’s incredibly competitive job market. It’s difficult to argue that Goldman Sachs hasn’t taken a leaf from the Mark Zuckerberg, Steve Jobs, HBO’s “Silicon Valley” playbook. Accordingly, Goldman Sachs isn’t the first bank that’s experimented with a less-traditional dress code in “an effort to woo talent away from Silicon Valley,” according to CNBC. However, the decision to relax the existing dress code was one of the very first moves by Goldman’s new chief information officer (CIO) Elisha Wiesel. It’s a fact that Goldman Sachs employees work long and hard. In fact, Business Insider reports that the move is a concerted effort to catch up with the “better hours and workplace perks” that Silicon Valley companies can offer their top software developers and engineers. For good reason: Fortune Magazine explains that when traditional organizations like banks look to recruit the bright and the skilled, they’re competing directly with “tech companies that have built their work cultures in fundamentally different ways” than them. What Do Users Think of WeWork’s New Acquisition, Unomy? Factor in the rising trend in coworking spaces and the growing remote-working … well … workforce, and all companies — not just traditional banks like Goldman Sachs — must figure out what workplace norms must be rethought and reworked. After all, once mundane tasks are taken over by automation and artificial intelligence, then employees will turn to specializations to prove their professional worth. We look at “Wall Street,” “Wolf of Wall Street” and “The Big Short” — movies that glorify and critique the ruthlessness of the financial industry — as entertainment indicative of a bygone era. No one wants to work those 100+-hour weeks anymore. Casual Fridays are nearly a thing of the past and we react negatively to things like Congress banning short-sleeved or sleeveless dresses. A relaxed dress code may seem silly and unnecessarily coddling, but it’s more indicative of change and progress. The average human being spends about 50 percent of their total waking hours at work. It’d be nice if that average human could spend that time dressed in comfortable, relaxed attire, working in a comfortable, relaxed work environment, wouldn’t it? And if G2 Crowd’s recent $30 million in funding round is any indication, the suit-and-tie culture and working hard aren’t mutually exclusive.